At last – some sunshine! 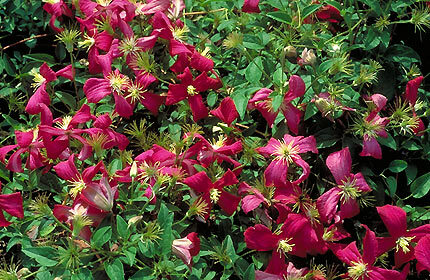 The perfect day to go out and cut back the late-flowering clematis to twelve inches or so above the ground. My father always maintains this job should be done on Valentine’s Day, so two days later isn’t too bad given the recent appalling weather. These are clematis which flower in the latter half of the summer, so the viticella and texensis types – mine include Etoile Violette, Mme Julia Correvon, Multiblue, Kermesina, Niobe and Black Prince, to name just a few. Prolific, late-flowering blooms, but they need cutting back now so they can put their strength into the roots and produce all that new growth by the end of the summer. There will undoubtedly be new green shoots higher up in the old growth, but just cut low down regardless – they’ll soon take off again! Don’t whatever you do, get scissor-happy and snip off early-summer flowering clematis, as they flower on the previous year’s growth, or species varieties such as montana, alpina and macropetala which flower in late spring and just need tidying up when they start to get out of hand. 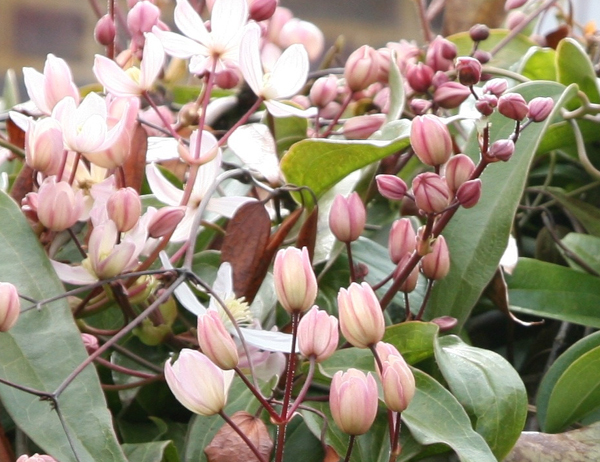 I once made the BIG mistake of snipping merrily through the stem of my clematis armandii, that beautifully-scented early spring-flowering evergreen clematis, thinking I was cutting back the Multiblue growing close by. I only realised when the deed was done and lost of all my flowers for that year… No lasting harm done though and the shed it grows up and around is now smothered in clematis – so much so that I probably should cut it hard back after flowering this spring: it’s starting to impede my whirligig washing line and opening the shed door is becoming ever so slightly tricky…. Sheds with bonnets are obviously my weakness: the allotment shed too is wreathed in a lacy topknot of rosy clematis montana, the deep-purple Etoile Violette and a delicate pale pink clematis alpina Willy. It’s certainly a sight to behold in flower; as to whether it played a part in camouflaging the shed in last year’s spate of allotment shed break-ins, I really can’t be sure. There’s certainly nothing of value in my shed (just second-hand tools picked up from the local dump, a little Calor gas stove for those essential cups of tea down on the plot, and all the flotsam and jetsam of netting, fleece and plant labels that goes with vegetable-growing), but it was one of the few that wasn’t broken into, so maybe its living overcoat did help a little…. Here’s hoping that’s just the first of many days out in the garden over the coming year. So much better to feel the sun on your face and your hands in the soil – or on the secateurs at least! AND STILL THE STORMS, the wet and the wind of this dreadful winter rage on… Flooding over a huge part of the country, no chance of getting out in the garden, dogs returning mud-bespattered from every walk – definitely time for some comfort food! My son was back from university this weekend with his American girlfriend and they put in a request for his all-time favourite winter pudding: Sticky Toffee. It certainly hits the spot on these dank, sunless days, all the better for being served with some homemade ice-cream – honeycomb or amaretto are two of my favourites. Well, it WAS his birthday, so what could I do but rise to the challenge? I believe my Sticky Toffee Pudding is the original Sharrow Bay recipe from the famous Lake District hotel of the same name. My version is now recorded on a very scruffy magazine cutting in my well-worn recipe scrapbook, but it has certainly stood the test of time! Pour ½ pt water over the chopped dates in a small pan and bring to the boil, stirring occasionally. Remove from heat, add bicarbonate of soda and set aside for 10 mins to cool. Set oven to 180˚C, Gas 4. Cream butter and sugar until light and fluffy, then gradually beat in eggs. Carefully fold in the flour, then the date and water mixture and vanilla extract. The mixture will look very loose and sloppy at this stage: this is quite right! Do not be tempted to add anything else to thicken it up! Pour into the prepared tin and bake for 50 minutes until springy to the touch and dark-golden in colour. While it’s cooking, prepare the sauce: mix all ingredients together in a pan over a gentle heat until they come to the boil, then simmer gently for 3-4 minutes until toffee-coloured. When the pudding is cooked, drizzle a little of the sauce over the top and return to the oven for 5 minutes. To serve, cool slightly, then cut into generous squares and serve with the hot sauce. Leftover sauce can be stored in the fridge and reheated in the microwave: you may find you need to add more cream in this case to keep a runny consistency. The sauce is also delicious with ice-cream and/or profiteroles! AS FOR THE ICE-CREAM, good vanilla is always acceptable but I like to make a very simple honeycomb ice-cream (no ice-cream maker required!) or an amaretto ice-cream which I do make in an ice-cream maker, but you could always part-freeze and re-whip in the time-honoured manner. The Honeycomb is simplicity itself: place 5 tbsp granulated sugar and 2 tbsp golden syrup in a pan and cook over a low heat until the sugar melts, then boil quickly until it turns a mid-gold caramel colour. Remove from the heat and quickly sift 1 tsp bicarbonate of soda over it – it will froth up dramatically, so stir gently to combine any loose powder, then pour onto a greased baking tray and leave to cool and set. Meanwhile whip 1 pint of whipping cream with a large tin of condensed milk (not the light version) until quite stiff. Fold in the honeycomb pieces and place in a freezer container. Freeze overnight until set: enjoy! And last but not least, the Amaretto for a more sophisticated treat: make a syrup by dissolving 4 oz granulated sugar in 4 tbsp water in a small pan and cooking for 5 mins until syrupy. Allow to cool completely. Whip 1 pt whipping cream with the cold syrup and 3 tbsp amaretto liqueur until it thickens and begins to hold its shape. Pour into an ice-cream maker (mine is a basic Magimix Glacier model where you have to freeze the bottom bowl in the freezer overnight beforehand: simple but effective – and not very expensive to buy if you make a lot of ice cream (or have made the mistake of making your own and are unable to revert back to the shop-bought stuff like me!). It should take about 30-40 minutes to churn, then turn into a freezer container and stir in about 12 crushed amaretti biscuits – or more according to taste! Freeze overnight and serve as desired. The alcohol content keeps this one relatively soft, but you may need to get it out of the freezer 10 mins or so before serving for ultimate unctuousness. There: probably most of your sugar quota for the month, but worth every mouthful. And just what’s needed whilst we wait for the first shoots of spring….